One of the many attractions of the Grand Canyon is the California Condor. Indeed, having no conception of the grandeur of the canyon, the only question I had asked friends returning from the canyon was, “Did you see any condors?” – a question answered, with one rare exception in the quizzical negative. On my visit to the Canyon on Memorial Day Weekend, I saw at least 7 distinct condors and it was a wish fulfilled. On the brink of extinction in the early 1980s, the last few remaining condors were captured for a rehabilitation program that is slowly but surely increasing their numbers. 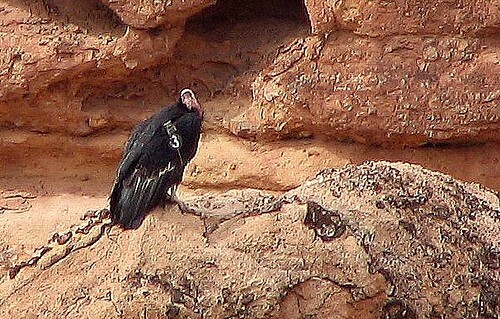 Condors are being bred in captivity at three centers in Arizona, California and Idaho. The goal is to have three separate populations of 150 birds each, two of these populations being wild, and the third being held in captivity to account for emergencies. At this time of writing, there are 63 wild condors in the Grand Canyon, and they can be seen gliding on the thermals at the South Rim near Tusayan, AZ. A ranger at the South Rim showed us how to distinguish between a condor and a turkey vulture, and between a condor and a common raven. Confusing the latter pair is not as ridiculous as it sounds, because the Canyon plays havoc with one’s sense of scale. On the backdrop of huge boulders and multicolored cliff faces thousands of feet deep, the nine-and-a-half foot wingspan of the condor is dwarfed significantly, and if one’s estimate of distance is unsound, a raven close by might be confused with a condor far away. At Vermilion Cliffs, a place one gets to by following the North rim eastward on route 89A toward Glen Canyon, an inn-keeper told us that condors are routinely seen from the Navajo Bridge, a steel arch bridge built across Marble Canyon at the point where the Colorado valley widens again into Glen Canyon. Sure enough, around 10 am on May 25, there were three condors near the bridge (1) #53, a four-year old condor who still hasn’t lost all the hair on his head and neck, (2)#3 who is eight years old and seems fully mature, (3) one condor whose head and numberplate I could not see. It is a fascinating bird – its ugliness on the ground compensated when one beholds it in the air – graceful, strong, unhurried. In the gliding position, the condor’s wings are positioned in a much shallower V than that of the turkey vulture, a characteristic I found useful when I couldn’t see the underside of the birds’ wings. This happens many times in the canyon, for instance, when one is hiking near the cliff while the birds are gliding peacefully in the canyon below. It was surprising to know that the feet of a condor are webbed, and not very useful for tearing meat; that job is performed exclusively using their beaks. It is thus a bird that needs very large quantities of carrion to feed while being unable to hunt on its own. This seems to have been the cause of their small numbers – as human civilization progressed over the Americas, land was reclaimed for agriculture, housing, and industry with the result that condor habitat and the probability of finding carrion must have dwindled, almost sending the birds into extinction. In addition, lead poisoning from consumption of meat riddled with bullets has also been held responsible for the death of many wild condors. For more detailed information, visit the Condor Re-introduction Program website. Very cool you saw one out in the wild! I’ve only ever seen them at the San Diego Wild Animal Park where they have the special breeding program. They are such fascinating birds. Indeed. And it is sad that their habitat has shrunk so much in such a short period of time (on an evolutionary scale). They seem to have these peculiar characteristics which have prevented them from adapting to human encroachment as robustly as (say) the turkey vulture.